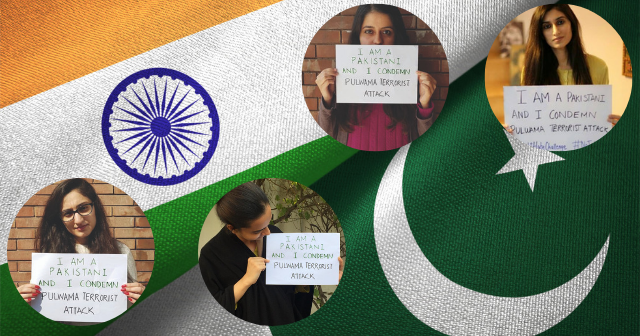 India-Pakistan relations have been pulled taut with recent events, but peace- lovers from both sides of the divide have launched an #AntiHateChallenge to urge both countries to maintain love. Here are the top six posts on social media urging us to #SayNoToWar. On February 19th, Pakistani Journalist Sehyr Mirza posted a picture on Facebook condemning the Pulwama terrorist attack and simultaneously launching her social media #AntiHateChallenge. 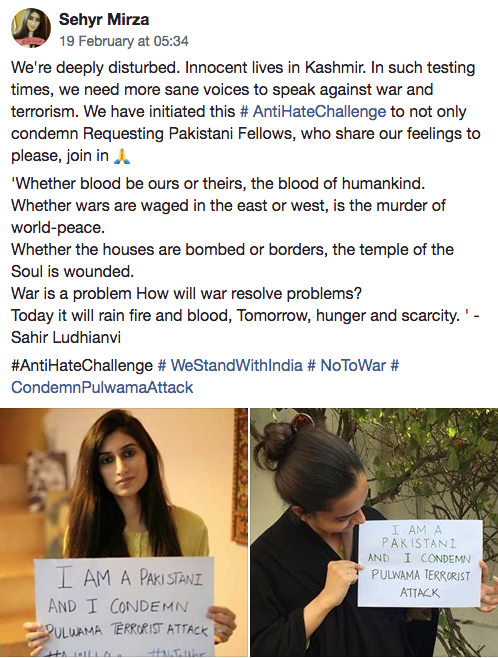 She urged her fellow Pakistanis to “express solidarity with our Indian friends” and stood firm on her choice not to “trade humanity for patriotism.” Within days, the hashtag #SayNoToWar was picked up by celebrities from both countries who wanted cooler heads to prevail to save civilian lives and homes. 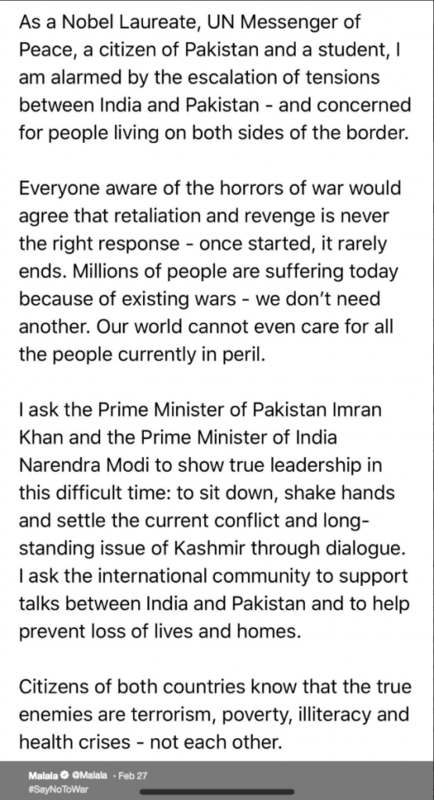 Malala Yousafzai, the youngest Nobel Laureate and a Pakistani activist for human rights, tweeted a powerful appeal for the respective leaders of India and Pakistan to respond with dialogue, not violence. Vishal Dadlani, Indian music composer, producer, and singer, has been sending vehement tweets daily urging for peace. The Human Rights Commission of Pakistan called for “mature diplomacy” in a calm and considered response worthy of this essential public institution. “The only war India and Pakistan should fight is illiteracy, poverty and violence.” Source unknown, this quote has exploded into the Twittersphere, with celebrities like Indian politician Rukshmani Kumari echoing the compelling phrase. Pakistani-Canadian actress Armeena Khan penned this eloquent question that calls for self-reflection amidst the chaos. 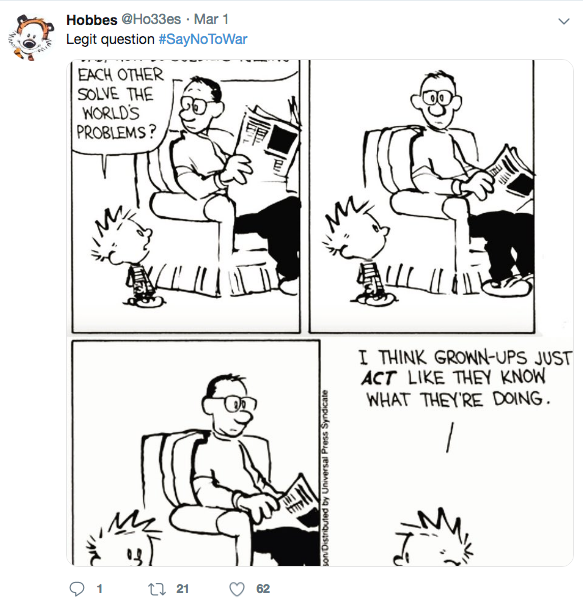 Out of the mouths of babes…Calvin from Calvin and Hobbes hits the nail on the head with this charming but cogent comic.